Israel Matzav: Like Gush Katif or like Amona? Like Gush Katif or like Amona? There have been a lot of foreboding items in the media lately about how the government is going to expel all the Jews from the village of Migron, and how it's going to be like the 'disengagement' from Gaza. But the pictures that go with those articles are typically not pictures of Gaza. They are pictures of the violent expulsion of Jews from Amona that took place shortly after the Olmert regime took power six years ago. And the prospect of another Amona should cause far greater concern. "This is not another outpost eviction," he said. "Migron is a community. 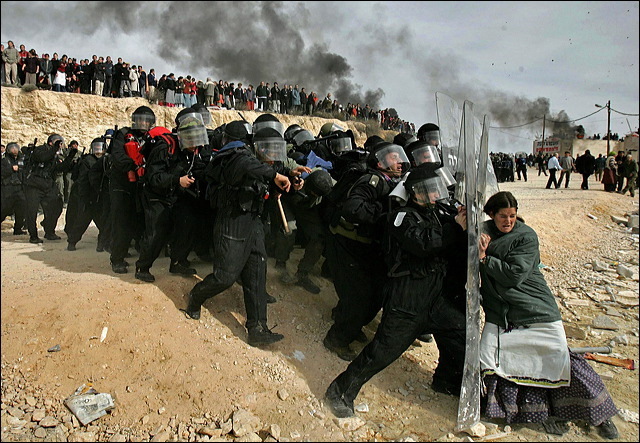 This is an unprecedented eviction compared to everything we have done until now." The officer further estimated that unlike outpost evictions, the destruction of Migron will not be over in one night. "I think the reaction of the settlers will also be more meaningful," he said. He added: "This step will also hurt the security aspect" – possibly meaning that IDF forces will have to be set aside to deal with Jews, thus compromising the anti-terror effort. The officer admitted that the press coverage of the Jewish riot at the Ephraim Brigade Base had been disproportional. "The subject received greater attention because of the spotlight that was pointed at the area that night. Events like this have happened in the past." The officer said that the IDF is worried about the rise in terror attacks on motorists in Judea and Samaria. Both rock attacks and firebomb attacks are increasing, he said. The technique of throwing rocks from inside a passing car at another car is relatively new, he said. "The phenomenon started last August. There appears to be a cell in Gush Etzion, and another one in Binyamin, that we have not yet put our hands on. The murder of Asher Palmer and his son gave terror groups a boost." Another dangerous and new terrorist technique, he said, is that of terrorists disguised as Israeli police who put up roadblocks and use a police strobe light to complete the illusion. The purpose seems to be abduction of Jews. Also, I remember thinking this in years past. They are vulnerable to attack and death (like Asher and his son and also the description in the article). And, even though they want to stay, thank God Israel is the kind of country who will not sit while they can do something to increase the safety of the people. (Obviously rockets are a harder problem.) Sometimes I think the level of spiritual existence overtakes the earthbound world we live in and people may not focus on protecting their lives on this earth. Of course, I'm not a good one to opine (except to say I want these people to stay with us on earth!) since I moved about every two years growing up - all over - and I can just plop down pretty much anywhere and be just fine. There are (or were) individuals who bought plots of land in Judea and Samaria - we had one in our family. I don't know exactly where and I think the children sold it (to Jews) after the area was liberated in 1967. As some one who lives up the road from Migron and who saw that the hugs approach to saving Gush Katif didn't work, I can guarantee it will not be peaceful. Carl, are the records in someone's attic? Your family, for example? Or the landfill? 1967 isn't *that* long ago... some prof could start some grad students doing this data collection, interviewing, document assembly for their masters program. Don't people have to file sale documents at some city courthouse in order to get a title document? Why does Israel just sit silent decade after decade about this, or make ancient claims, when you could be assembling this stuff? Maybe we should put together a team of Israel Matzav devotés and apply for a grant to do it ourselves?